A Wedding Video to Obsess Over! September, 15th 2018 we had the absolute pleasure of filming Suejin and Will’s beautiful wedding. 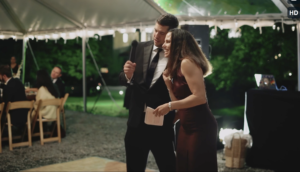 From the font used in the video title (which was taken from their wedding invites and menu) to the carefully curated highlights of the wedding speeches, we worked tirelessly to ensure their video was as perfect as their wedding day. In order to do this, we asked the couple to fill out our “Tweed Sheet.” This detailed document allows our videographers, colorists, and editors to know exactly what a couple is looking for in their wedding video. We make sure to include every moment, family member, and detail that is most important to them. For Suejin and Will, the most important aspects of the video was the ceremony, first dance, speeches, seeing guests enjoy themselves at the reception, and the stunning venue. Even watching it back now, we get a little misty-eyed watching their ceremony (call us lame, but whatever, its true). Especially when Suejin says “you are my living proof that destiny exists, meeting you has not only changed my life in so many priceless ways, it has also made sense of every action, discussion and incidents that have happened in my life, because they all led me to you.” And when Will responds in his vows with “I will cherish the light you bring into my life every morning and appreciate with tenderness the bliss of closing my eyes with you before we fall asleep, knowing you will be there in the morning.” Adorable, right? When Suejin walks down the aisle, we can’t help but smile, almost as big as she did. Weddings can be magical, and we think this one truly was. That moment at 5:14 gives us goosebumps and is a reminder that true love exists. Okay, okay, we’ll cut it out with the mushness now, don’t worry. We can assure you that being part of their cocktail hour and reception was just as fun as it looked. The guests loved the wine on tap, fire pit, and dancing music. Once the speeches were over, they never left the dance floor! The uniqueness of their special day was highlighted in the finished video with songs which the couple picked that spoke to their relationship. One of the bonuses of working with Tweed Weddings, is we can aid in picking songs that are unique and underused in wedding videography. The laughs, the tears, the funny moments, and the romantic ones, we capture them all. If you’re recently engaged, we’d love to chat more about your wedding and how we can make your wedding video something you’ll watch every day. Let’s talk.